Once the nice weather hits, I like to spend as much time as I can out on our deck. As much as I love to bask in the sun, it’s important to provide my dogs with ample shade and a spot to cool off. 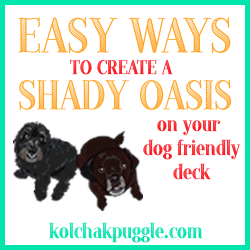 Check out these 6 easy ways to create a shady oasis on your dog friendly deck or in your back yard. Kol’s Note: This post contains affiliate links. For more info on our affiliates and our linking policy, please click here. At Casa de Kolchak, it’s the season to get outdoors and spend some time with your dogs. The warmer days and drier weather, means we’ve been hanging out on our deck a lot more and hiding in the house to avoid the rain a lot less. We’re on a quest to create the perfect dog friendly deck space that the boys and I can enjoy together. First up, we banished the bugs by planting dog friendly mosquito repellent plants and herbs. We’ve already tried burning sage a couple of nights and aside from smelling great, it also works like a charm. Next up, we’re looking for fun ways to create a shady oasis. When you have dogs, especially black dogs making sure your dogs don’t over heat in the hot weather is so important. Dogs don’t sweat to release heat like humans do, they pant and sometimes, they just can’t pant enough to keep up with the hot summer sun. Providing your dogs with a shady spot where they can go cool down is essential for any dog friendly deck or yard. What do you do when you’re not a fan of traditional dog houses?! I’m not going to lie to you folks, I totally get why those Igloo looking dog houses are so popular. I mean, who doesn’t want to feel like they’re creating a cool spot for their dog to chill out? There are just not my taste at all. Even though the smallest version is about the right size for my dogs and it would fit on our deck, I’m looking for a solution that is a little bit more decorative. I turned to the interwebz in search of cool ways to create shade for dogs and the interwebz did not disappoint. 1. 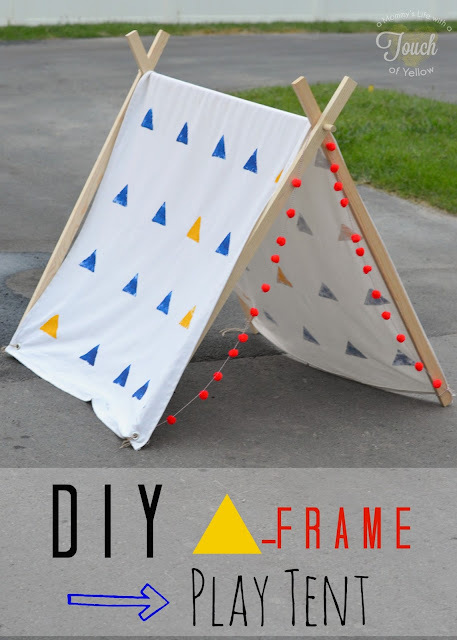 Use a Ridiculously Adorable Foldable Tent from A Mommy’s Life With A Touch of Yellow. 2. 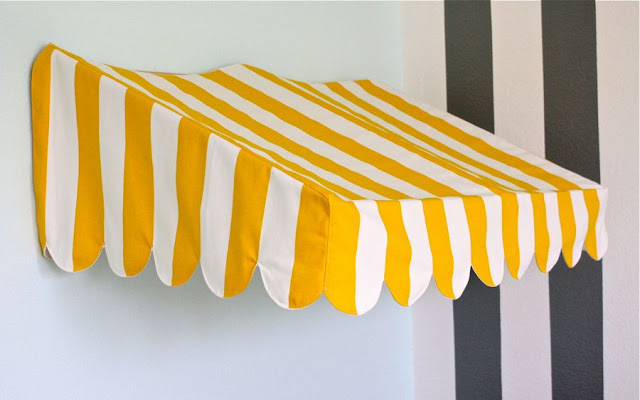 Make Bistro-Inspired Awning from Dana Made It. OK, so in the right space, this little cafe inspired awning would be so woofing cute. 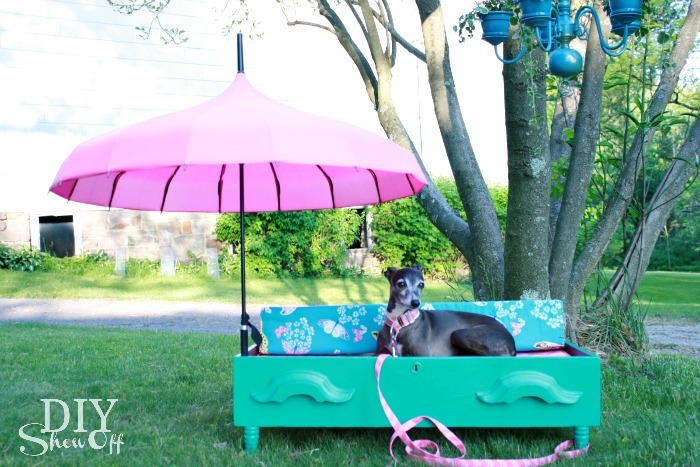 It’s incredibly easy to make and I bet, if you matched the awning to your dog’s outdoor dog bed it would be absolutely ridiculously awesome. Can someone puh-lease do this and then send me a picture of their dog loving it? PLEASE?! (You guys, I would make it for Kol, but he’ll assume it actually IS a bistro out there and I’ll have to spend all my time making him fresh baked dog treats and serving his fancy flavoured water for dogs… oh wait. I already do that. Spoiled rotten dog *grumbles*) Get instructions on how to make this for your dog at Dana Made It. 3. Make a fabulous dog bed designed for canine rock stars from DIY Show Off. 4. Create shade in an awkwardly shaped space with a Sailcloth Shade from Apartment Therapy. You guys, this is genius! Our deck is really spacious, but it’s thin – thinner than your average apartment deck anyways. This sail cloth shade can be made to fit in any space AND it easily comes down when you’re not using it! It’s made with a lightweight, breezy muslin, so it has a light airy feel instead of a heavy dark feel that some canvas awnings can have. Learn how to make this for your home over at Apartment Therapy. 5. Take shade where ever you go with a portable shade canopy from Alcott Adventures. No matter how you create it, your dog friendly deck will have it “made in the shade” with these funky, cool and stylish options. Do you love hanging around outdoors with your dogs as much as I do? How do you make sure they get the shade they need? All through the month of June, we’ll be sharing our tips and tricks for creating the perfect dog friendly deck or yard. Keep checking back to get all the details and send your brilliant ideas our way! Who knows, maybe you’ll be featured in an upcoming post! OMD I’m loving these! We have a really big umbrella outside and I normally can go in and out as I please, but I wouldn’t mind my own pup tent! It’s TOO CUTE Olive. I kind of want one too. Simple and neat; love it. Good ideas. Luckily we have a nice yard and there is always some shade somewhere. Even when we had our yard it was BIG and OPEN, so Mama always had to make our own shade. You’re very lucky yours is so shady. I bet it pretty too! ooooo, might have to make Rita a pup tent for the deck! If for no other reason than it’s cute as woof, right?? She would be too sweet in her own pup tent! Love the tent – super cute! These are good small space ideas. May just have to share this.